More music/videogame convergence with the arrival of the Korg DS-10 “game” for the Nintendo DS handheld game system. This program emulates a couple of vintage Korg MS monosynths, plus four more stripped down drum synths, plus some effects, plus a basic step sequencer and pattern chainer. 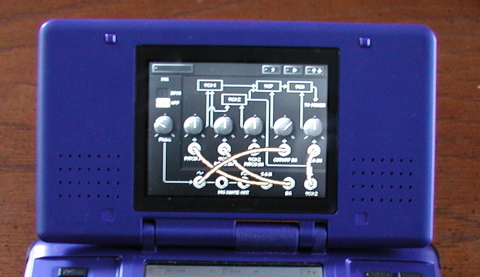 Basically you get a little electronic music sketchpad that can run on your DS, which is pretty cool. I have no idea who had the idea to develop this, and no idea why their company gave them the go ahead to do so, but this is a real music tool that was obviously created by real musicians, and is really not a game at all. Here’s a little demo song I made when playing around with it a little bit. The softsynths included in the program actually sound pretty good, certainly at least as good as the synths that come with most “real” music sequencers. You can even move around some virtual patchcables to make some more complicated sounds or modulate things. The drum parts remind me of the Electribe ER-1, in that they are all synthesized blips bloops and splats. The program in general reminds me of the Electribe EA-1/ER-1 pair I used to use to come up with ideas, but it actually sounds a bit better and the synthesis is more powerful. 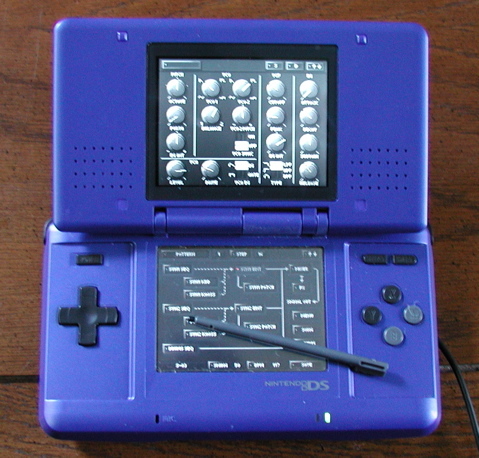 It is a little bit more difficult to “play” than the Electribes, as it has several levels of menus that need to be navigated, and you can’t beat the immediacy of just grabbing a dedicated knob or pushing an actual button when you need to, but along with being more powerful than the Electribes the DS-10 is also much more portable and convenient. All in all, I was really impressed with this program. Good use of the DS touchpad and interface, and it is a steal at under $40. Besides the Electribes, it reminds me of the program Rebirth, the first really cool softsynth that emulated a couple 303s and 808/909s, and stormed on the scene in the late 90’s and changed everything. This is like Rebirth, but better and cheaper and super portable. Back in the day, I would have killed for something like this to learn how to write electronic music with. These days, there are tons of cool and powerful and cheap tools out there for aspiring electronic musicians. So, where’s all the music, kids? On that note, I need to finish up slowburn this week. I’ve been telling myself to just take as long as it takes, but obviously that hasn’t been working lately. So the official deadline is now Friday. New Moog filter plugin from UAD. It sounds great, particularly the distortion stage which mimics the Moogerfooger input stage, and has 2-pole and 4-pole lowpass, bandpass and highpass filters. It’s very DSP hungry though, it uses up a lot of the UAD cards processor power and the UAD-1 doesn’t handle plugins like that very well. Still, it sounds great, has LFOs and some nice stereo-izing features, and won’t hum and tune in local radio like the hardware Moogerfooger filter pedal that I had to return. I will probably get this, and may use it for last minute tweaks on a song or two as I finish up slowburn. I hope they do more effect plugins, I still use the Roland plugins on every single song I mix. And a new compressor plugin from Audio Damage called Rough Rider. It’s not modelled after any particular piece of real hardware (as far as I know), it has all the usual compressor parameters but is fairly straightforward. I’ve mostly tried mangling drum loops with it, and it does that well. It doesn’t give you numeric values for the various knobs, you’ve got to just play it by ear, which is cool. It seems to have some distortion/limiter stage in there, everything comes out limited to 0dB with some nice added harmonics (the “rough” part of the name, presumably), which is nice. Oh, and it’s completely free, so there’s no excuse not to grab it. Audio Damage just released a new chorus plugin named Fluid that sounds fantastic. It’s the first one I’ve heard that matches up with the UAD Roland choruses and sounds like a “real” hardware chorus. It also has more control over the sound than the UAD ones do, but, importantly… not too much control. Sound-wise, it reminds me of the Analog Man Chorus pedal, which was modelled after the Electro-Harmonix Small Clone pedal and ended up being my favorite non-Roland chorus that I used during this project. This plugin along with AD’s through zero flanger Liquid and their analog-modelled delay Dubstation make a great vintage sounding plugin combo pack. I’ve already used Fluid on a couple slowburn tracks, I’ve been trying not to overuse Liquid, and Dubstation has been used heavily from the beginning. Since we started the project, the native plugin effects world has really improved. Audio Damage released those effects, and SoundToys released their set of modelled plugins which also sound fantastic. Add in the latest release of AmpliTube, the native plugin versions of Line 6’s models, and the already superb UAD ones and things are really starting to get pretty good in the world of computer based effects. I’d go as far as to say that if all of these had been available when I started, I probably wouldn’t have bothered buying a bunch of hardware effects for this project. 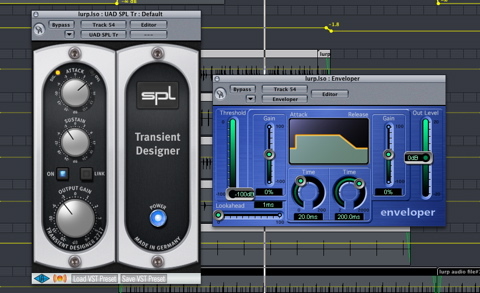 The flexibility and ease of use of software effects have been there for a while, now the sound is finally catching up, a few years behind when the same sort of progression happened with software synths. I need an audio editor to do fine-tune chopping and format conversion of samples to get the drum sounds ready for the Transistor set. In the distant past I used Bias Peak, but at some point along the upgrade path they lost me and added stuff I didn’t want and didn’t like. Next I tried DSP Quattro which was pretty good, but never quite felt right and had some weird audio format quirks that my Korg ESX-1 didn’t like. I was very interested in Apple’s Soundtrack Pro, but they stopped offering it as a separate product and I’m not interested in buying the Final Cut Studio package just yet, plus I am unsure what sort of future support it will get. And Dallas pointed me to a couple other programs called Amadeus Pro and Wave Editor that I will likely also check out. Two new toys, err, tools arrived today… an Analogman chorus and an Ibanez flanger. Like the Roland PH-1R I mentioned in an earlier entry, they are analog stompbox effects intended for use with a guitar. Unlike the PH-1R, both of these are still in production and were bought new. 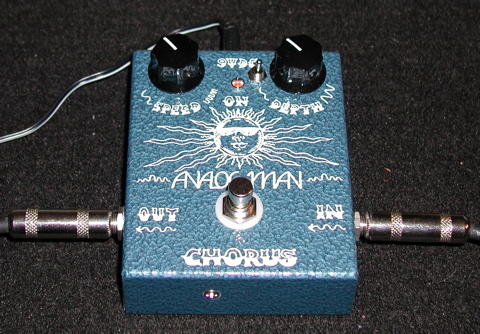 The Analogman chorus is a clone of the old Electro-Harmonix Small Clone chorus, as used by, among others, Kurt Cobain. This one is made by a boutique effects pedal builder who also wrote a great book on vintage effects. EH has since re-issued the original box using the same Small Clone name, but now they use some different chips and circuits and it allegedly doesn’t sound as good (of course) as the old version. Eh, whatever, anyway… the Analogman clone of the Clone also has some improvements over the old version, it looks purty, it’s handmade in the good old USA, and chorus is pretty much my favorite effect. So I got one even though they’re kind of expensive. It sounds great and looks cool and I love it already. 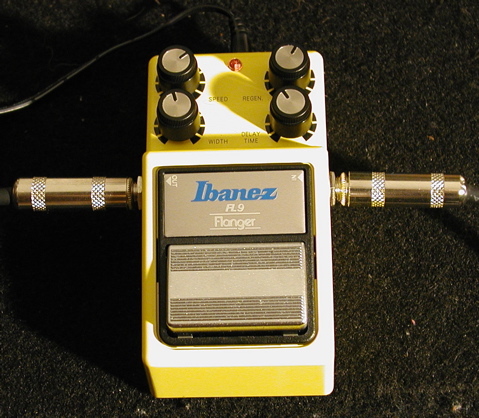 Next is an Ibanez FL9 analog flanger. It sounds nice, but it’s fairly polite and clean, and so far hasn’t grabbed me by the throat and yelled “Keep me!” However, it’s important to remember that an effect that sounds very distinctive and noticeable and cool will also usually grow old very very fast when you use it too much, and in some cases if the effect is dramatic enough, too much can equal “twice”. So we’ll see how this one fares through the recording process, how much it gets used, and what it gets used for before deciding whether or not to sell it on. Also important, just like using a synth, it can sometimes take a while to find an effect’s sweet spot. But, sometimes you never find a spot you like within its settings, so eventually you trade it for something else. The most important thing the FL9 will need to do to stay around is find some way to distinguish itself from the digital flanger models we have in the Kurzweil KSP8 and some of our plugins, because currently my impression is that it’s lacking the distinctive character necessary for me to go out of my way to use it. FL9 on Lead Synth. Dry, then progressively more and faster flange. FL9 on Bass Synth. Dry, then progressively more and faster flange. FL9 on Pad Synth . Dry, then progressively more and faster flange. You can make flangers sound more dramatic by adding some distortion before the effect. I didn’t do that in these demos, but will experiment with that some more as we record things. Chorus and flanger are both delay based effects, and are closely related circuit-wise. 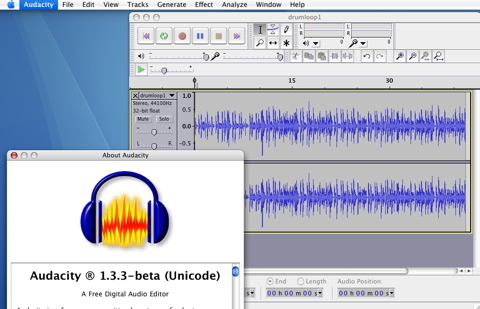 Chorus is generally used to thicken up a part by adding a short modulated delay or delays to a sound to make it sound like multiple instruments — a chorus of instruments — are playing. A flanger also thickens things up, but is stereotypically used as sort of a special effect: the jet plane whoooosh you hear on a lot of late 60’s and early 70’s music is often a flanger (though sometimes a phaser, as mentioned in an earlier entry). Like a chorus effect, a flanger also works by adding a short delay and modulating it, and you can in fact often make a chorus-like sound using a flanger pedal by setting it on less extreme settings. The flanger effect was invented by the Abbey Road engineers while recording a Beatles album; they played back multiple copies of the same take on the tape reels, and manually slowed one of them down a bit by pressing on the reel with their finger. Later, both chorus and flanger effects were implemented in an analog circuit fashion by using BBD delay chips. These chips have recently gone out of production, and the only currently made mass produced substitutes are some allegedly noisier and inferior chips cranked out from China, which is why many people prefer either older versions of these pedals or smaller run boutique versions that use hoarded remnants of the old chip stocks. So why are we using guitar pedals for our synthesizer based music? Shouldn’t we be using, uh, synthesizer pedals? Well we would, but nobody makes synthesizer effects pedals. 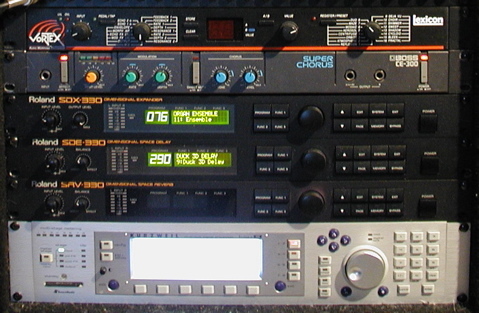 Most synth players use multi-effects processors, which do everything in one box, which is cool, but not always distinctive. You often end up with a jack of all trades, master of none type device. The latest crisp, clean, digital based models always sound great, but also somehow lack… something. Since we are limiting ourselves to using just one synth for this project (the previously mentioned Nord Modular), we decided we would try to get some more variety in our sounds by using a bunch of unique and/or weird effects that have a distinctive character of their own. Since most of those types of effects are currently made for guitarists in the form of pedals, that’s what we’re going to use. We will still be using some rack based effects when they offer a cooler or more controllable alternative than pedals, such as in the case of analog filters, some types of delay based effects, and reverb. But we’ll also be experimenting with stringing together a bunch of random guitar pedals that weren’t designed for our synths and see what happens. That brings us to the question of whether or not you can even safely use a guitar pedal with a synthesizer. Keyboards run at line level with low impedance, the pedal expects a guitar type signal with higher impedance. We will talk about this more in a later entry, and I am not an expert so don’t take my word for it… but for now, the short answer is yes, as long as you are careful with your volume levels going into the pedal (it most likely expects a lower level than you will be sending into it), and as long as it sounds good to you coming out of the pedal, you’re okay with just plugging in the stompbox directly after your synth just like you would a rack effect. The longer answer involves buying some extra equipment when just plugging it in doesn’t sound good, but we’ll talk about that another time. Anyway, I am getting distracted from the topic of drum machines… in short, we did re-write everything, we didn’t use any drum machines, and the live set actually got noticeably better for it. One of the nasty secrets of making electronic music is that you can write some really mediocre music and when you put a beat behind it, it still ends up sounding pretty damn good. 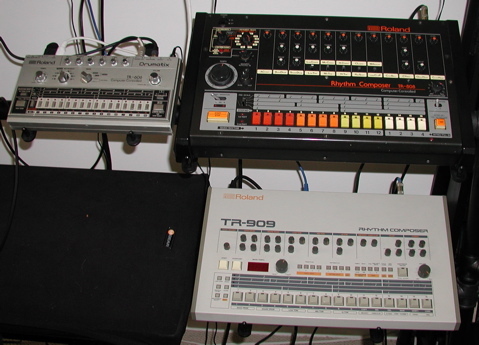 This is particularly true if you use either of two of the machines pictured above: the Roland TR-808 and TR-909. The 808 has been a defining drum sound in hip hop, from old school to present day, as well as electro and pop and everything in between. The 909 is, was, and will continue to be the defining drum sound in electronic techno and house music, there simply is no other substitute other than… samples of the 909. Basically, the sounds these two machines make are so familiar, and so ingrained in the subconscious of many an electronic music lover after having heard them pounding out beats for eight or twelve hours at a stretch long into the night and through to the next morning, that you can get away with murder as long as they sit there banging away and doing their thing behind the rest of your crappy song. Take them away, and you have to work a lot harder to write something that will interest people for an extended period of time. So, in the end it turned out to be a good thing that we were forced to leave them behind, and focus instead on the melodic and textural aspects of the music. Even just the process of re-working our old songs into a new style was good for us, but I still think taking away the crutch of beats was the real key. Once we got back from the craziness of Nevada though, and started looking for other places to play this set, we had a thought: now that we had music that sounded good even without drums, hey, maybe it would sound even better if we then put them back in? And so that’s what we did, and it did in fact sound even better with the drums back in, which was great. For this studio recording, we are going to try to balance the two extremes, and use drums in some parts and leave them out in others. This album is definitely intended to be a kick back on the couch and space out sort of experience, and not a party all night dancefloor packer. The beats will most often kick in to accentuate the building and releasing of tension, and they will all be heavily processed by external effects equipment much like the synth sounds will be. We will be exclusively using the three drum machines above: the 808, the 909, and their little brother the 606. We will also limit ourselves to sequencing them using only their internal sequencers, and we will resist the urge to sample and re-process them. So there will be no fancy computer tricks, just basic old school patterns and sounds made by quirky old analog drum machines. Perhaps the best thing about these drum boxes is that beyond just sounding great, and they do sound great, they are really easy to use and just flat out fun to play around with. Hopefully they will be able to add some of their magic to the slowburn recording process.